Enable the Advanced Features Tab First. Why do you want to use the Yoast SEO? 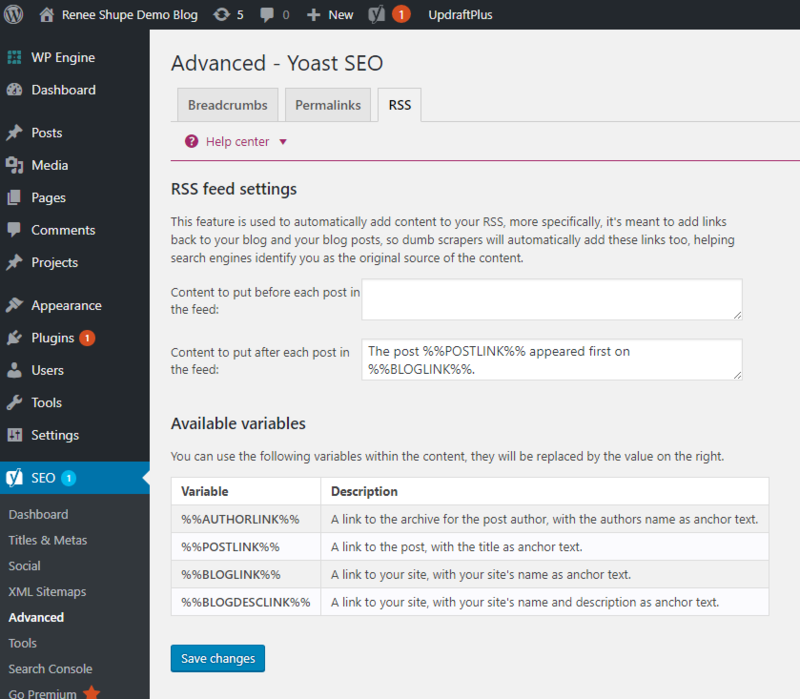 The Yoast SEO plugin for WordPress is in my opinion the best plugin to help you manage and improve your Search Optimization, so you can be discovered by both Google and your readers. Yoast SEO won’t do the work for you, but the plugin will give you the checklist to make sure you’re hitting many of the key elements to make the chances of your post being found even better. 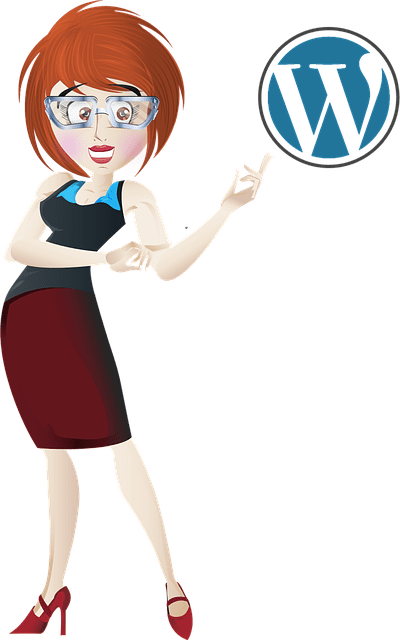 If you have installed a plugin before on your WordPress website then you can go ahead to the WordPress repository and search for Yoast SEO then install it. If you haven’t installed a plugin before here’s what you’ll need to do it. Click the Install Now Button and then click Active Now once it’s installed and the Install Now button changes color. When you click on the SEO icon in your side bar, you’ll find it near the bottom on the left hand sidebar from your WordPress Dashboard. There is an option to use the Configuration Wizard, which you can use, but this guide will walk you through all of the key elements step by step. The Features Tab is one of the sections you want to focus on. Let’s review the different sections and what you may or may not want to have set up. You want to make sure that you have the Advance Settings Tab enabled. You will find this on the Features Tab in the Yoast SEO Plugin. Don’t forget to click on the save changes button to store your settings. 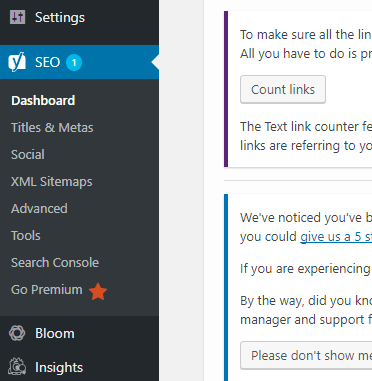 You will now notice new items appear under the SEO option in your WordPress menu. A little bit later I’m going to review each of the sections and what you’ll want to do to set up all the features for this plugin. 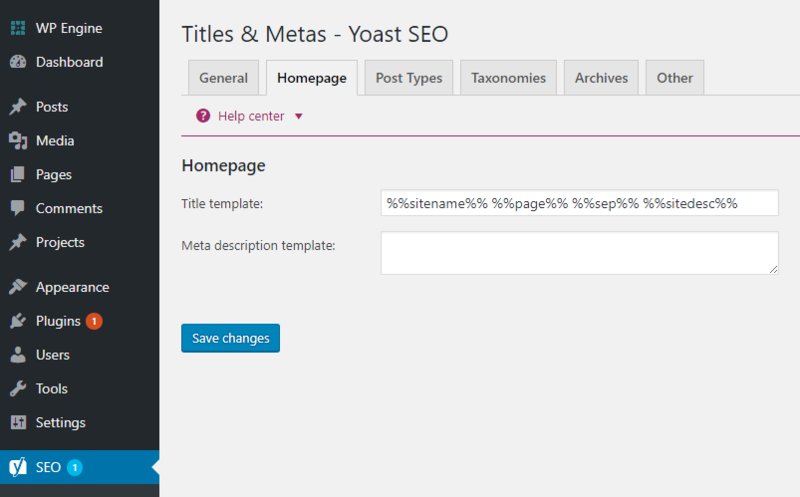 Let’s move on to the next main tab in the Yoast SEO plugin. The Info Tab is just what it says. This is where you’ll want to provide the information about your site, yourself or if you identify as a company the companies details. First you need to provide a site name and an alternate name for search engines to consider. Your site’s name could be your site’s title. Google will use this information to display in their search engine. Next let’s move to the Webmaster Tools Tab. Webmaster tools let you see insights and other data about your site from specific search engines. If you have a website you need to at a very minimum setup the Google Webmaster Tools, now called Search Console by Google, this post walks you through the steps to getting Google’s Search Console set up. To be able to see the data that Google Search Console can provide you need to add a meta tag to your site or upload a file to the backend of your website via FTP. 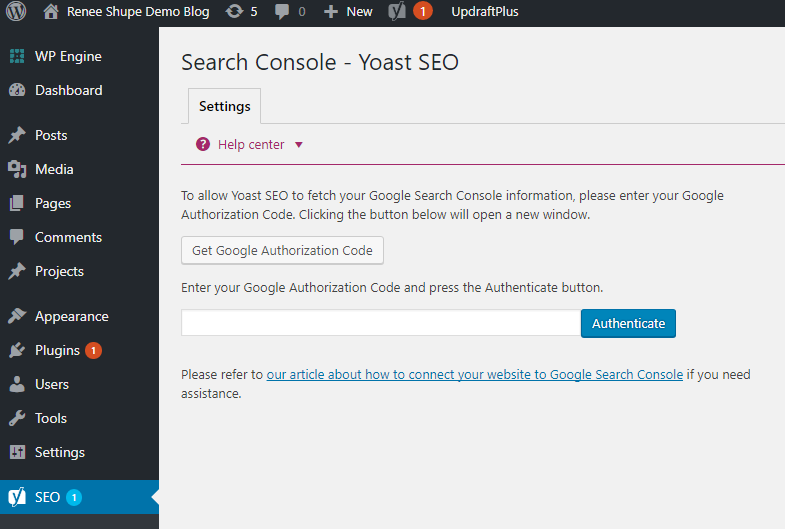 The Yoast SEO Plugin makes this easier by letting you add the meta code you receive when you are setting up your site in Google Search Console. You can use this same process to set up Bing and Yandex if you desire. Of course leave it disabled if this is an area you don’t want to use, but if you know you want to be able to easily noindex a page then enabling this for your site is a good idea. 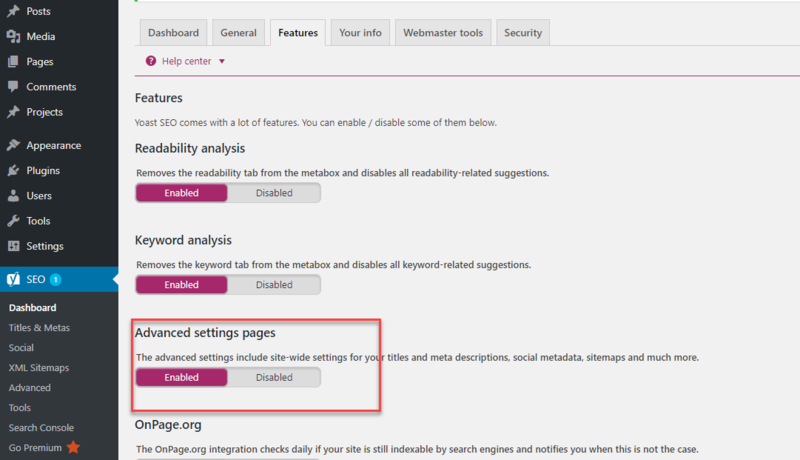 This section will cover the different advanced settings found in the sidebar of your WordPress. We will cover each one of them: Titles & Metas, Social, XML Sitemaps, Advanced, Tools and Search Console. Titles & Metas section under Yoast SEO has several tabs in it. 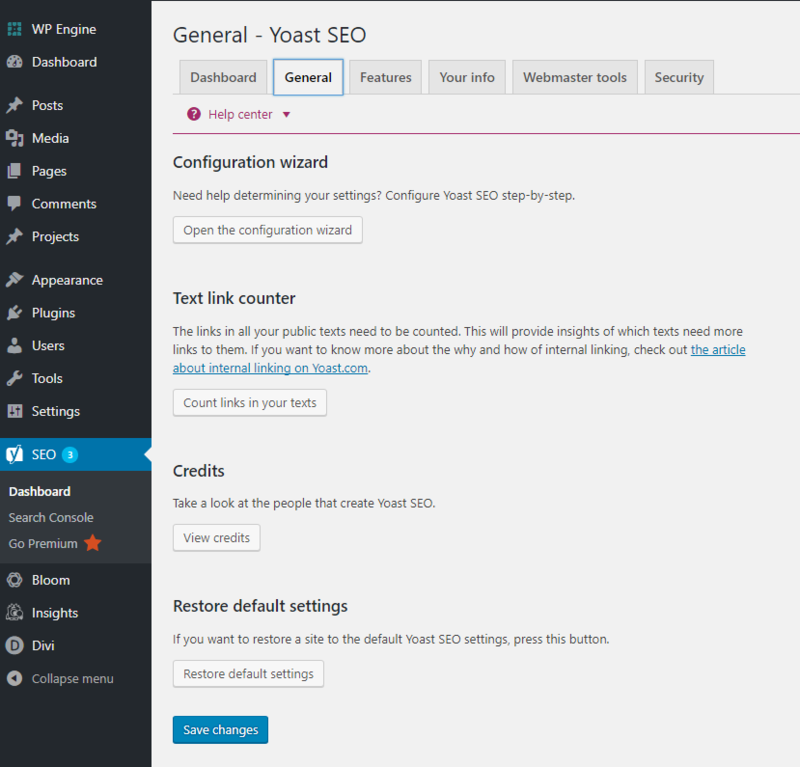 My recommendation if you’re just getting started using the Yoast SEO Plugin is to keep the default settings that are already set up with the Yoast Plugin. There is not hard and fast rule for this though so be sure to check the settings and adjust as you see fit. 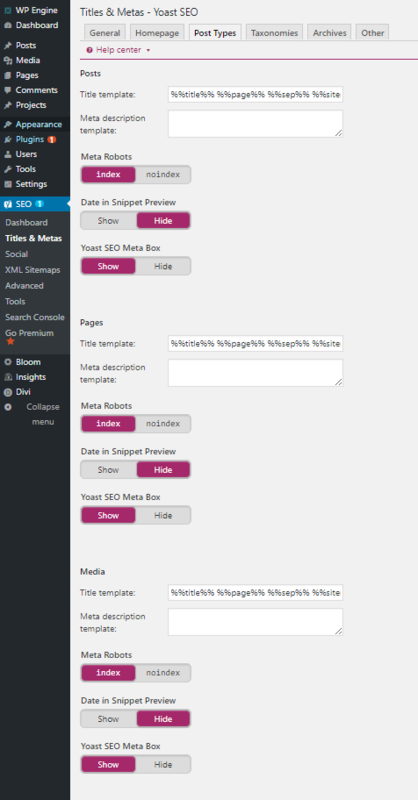 Let’s now review each section of the Title & Metas section in the plugin. This section allows you to choose the title separator that will be used when someone searches on Google or any other search engine. You can see an example in the Google Search sample I provided. I decided to go with the star, but you can choose any of the ones or keep the default. Completely your choice. 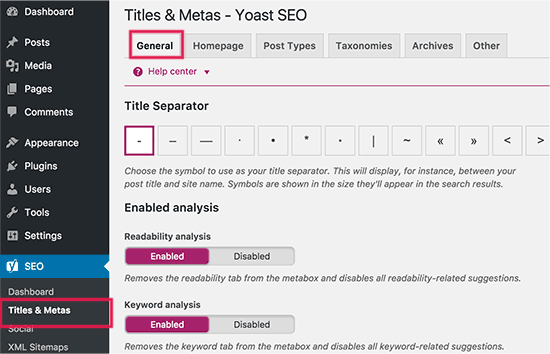 On this page, you can also disable readability and keyword analysis tab which appear under the Yoast SEO metabox when you are writing post. I recommend that you leave them enabled. Just as the tab says this section is meant to define your Homepage Title. By default you will see these fields pre-filled with title-template. On your homepage it’s likely you’ll want to a static title, description, and keywords. But for posts, the title will vary from one post to another. Using this title template feature will allow you to define a way that the title and other meta information is pulled and organized. As you can see in the image below by default the template variables in the title field work fine for most websites, but you can definately change it if it needed. The next option is to enter your site’s description. Once you are done, click on save settings button. Note: If you are using a static homepage, there will be additional options to change your homepage title and metas. 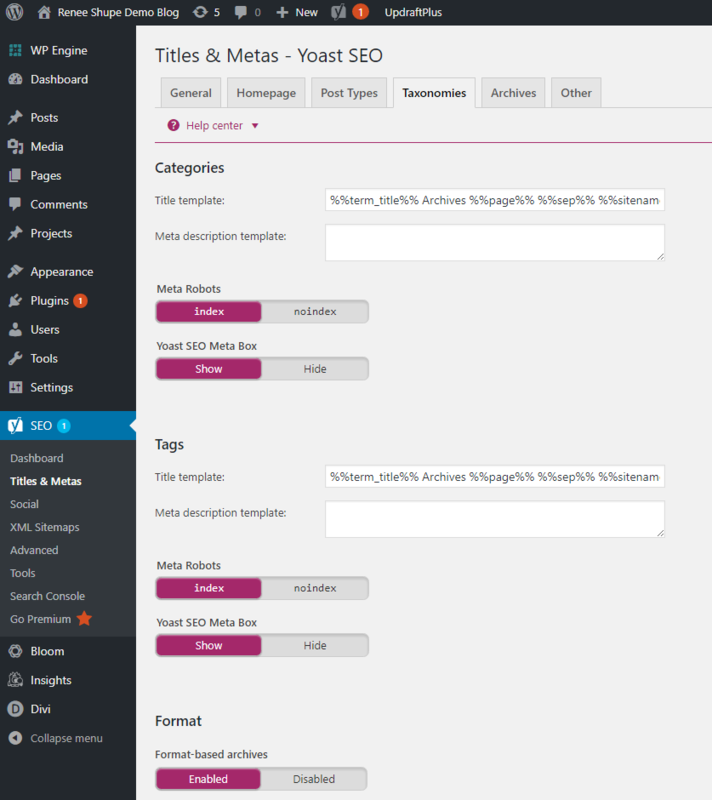 Yoast SEO plugin allows you to set titles and meta for posts, pages, media, and other custom post types. This site-wide title and meta description will be used if you forgot to add title and meta description for individual post, but it’s recommended to try and make sure that you customize each option in the meta box. I recommend leaving the description fields blank for all post types here. I also recommend using only the post title as the title template. This section lets you customize the titles and meta for your categories, tags, post format archives and any custom taxonomies you may have. The default settings in this section should work just fine for most bloggers and website owners. Any descriptions you include in your categories or tags will automatically be picked up by Yoast SEO so you can leave the description area blank. If you don’t have an description for each of your categories or tags I recommend that you go to the categories & tag section on your site and include some helpful keyword friendly descriptions. If you want to learn more about categories and tags this article from Yoast is very helpful. 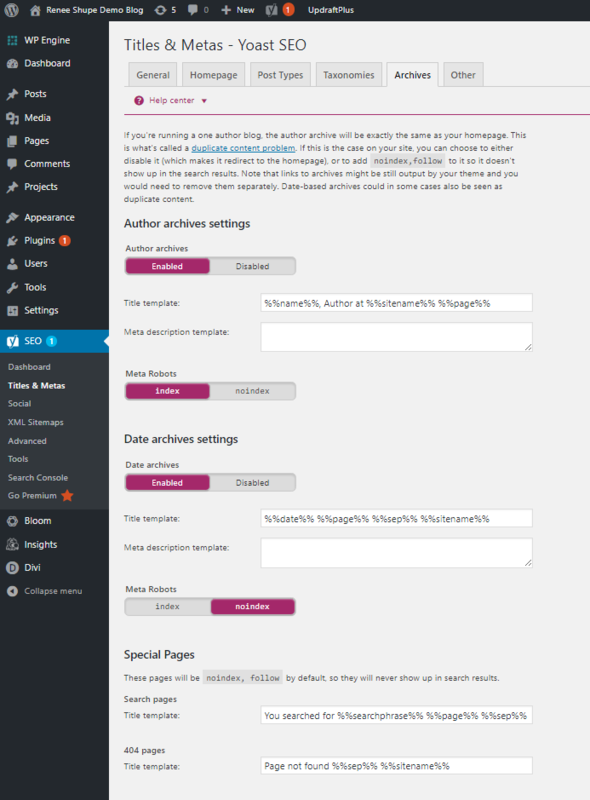 The Archives tab let’s you customize the title and meta settings for the author and date archive page as well as any special pages you have on your site including the search and 404 pages. Just you running your blog? If you’re running a solo author blog you can disable the author archives. Since both the author archives and your main blog will contain the same content this helps to prevent an duplicate content issues. The other tab has some additional settings. Like you can disable picking up descriptions from Dmoz or Yahoo directories for your pages. If you are unsure what to do here, just leave all of them unchecked. The first tab under the social settings is for all your social accounts. 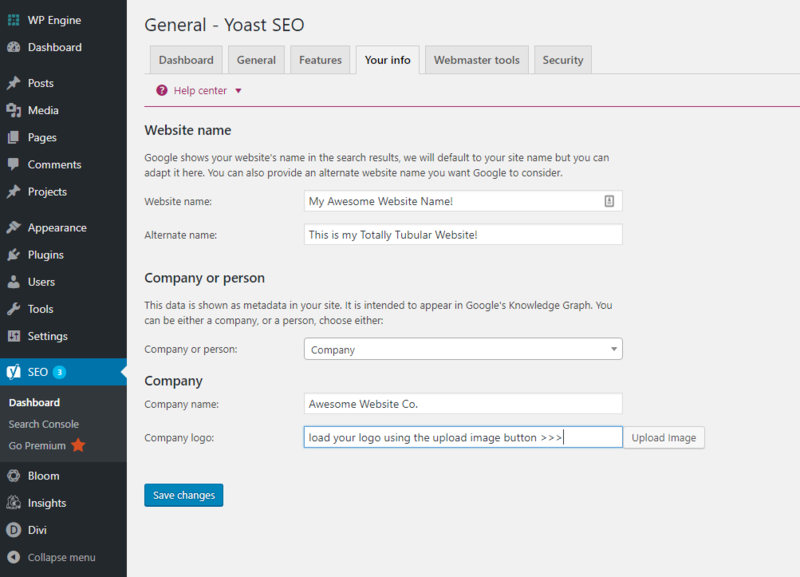 This section allows the Yoast SEO Plugin to tell Google about your social profiles. Just add your URLs for Facebook, Instagram, LinkedIn or any of the other platforms you use. For twitter simply add in your user name. On this tab you’ll want to confirm that the open graph meta data option is enabled. This allows the plugin to add the Facebook Open Graph meta data to the <head> section of your website. Doing this helps Facebook pick up the right right thumbnail and page information when a post from your website is shared on Facebook. Go through the balance of this tab and fill in the requested information including the SEO title and description for your home page or choose to copy the home meta description. You can also include a default image which helps if for some reason Facebook can pick the right image for your blog post. You will also want to associate your website with a Facebook profile. This profile either be a user profile or a Facebook app, usually it’s best to go with a Facebook profile. If you choose you can also set up a Facebook admin which will give you access to the various Facebook insights for your site. This tab gives you the option to add Twitter cards to the head section of your website. You can also choose how you want your information display, I recommend using the summary with a large image. Before I dive into this section, if you have already verified your site there is nothing you need to do here. Pinterest, like Facebook, also uses Open Graph meta data. To make this work you need to make sure you have the open graph meta box check off under your Facebook settings tab, as shared earlier in the post. Once you have that checked you need to go to your Pinterest Account and get your site verification code that is provided by Pinterest. Once you have started the process to verify your Pinterest account you’ll be provided with a meta tag that you can add here. Many think that Google+ is an unnecessary service and provides no benefit to the SEO of your site, but remember this service is created by Google so no matter what you think of it it’s good to have at least some presence on the service. This section really only applies if you have created a business page on Google+. That is the URL you’ll want to include here and then go to your Google+ business page and enter your website’s URL in about section. XML Sitemaps are a must and absolutely essential to your WordPress site. Having an XML Sitemap is the quickest and easiest way to get indexed and notify search engines about your content. Sitemaps also give you control in telling the search engines how to map and prioritize your content on your site. Thankfully the Yoast SEO plugin makes this process really easy. To get full details you can read Yoast’s article on how to enable your XML Sitemap. Let’s walk through each section of the XML Sitemaps. First step is to confirm that you have the sitemaps features enabled. This is simple, disable it. Review the different post types that are listed. This will be different for each site because it’s dependent on what you have set up as well as was post types may be provided by your theme. 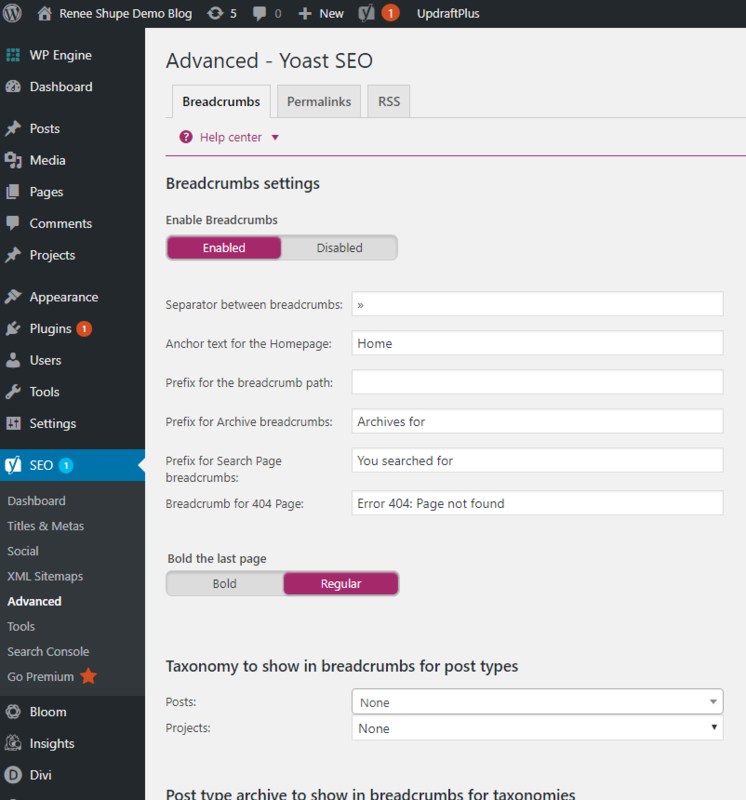 By default, Yoast SEO disables Media Attachments from sitemaps. Same here. Review and disable any taxonomies you don’t want to appear in the sitemap. The excluded posts tab allows you to remove individual posts,pages, or custom post types from XML sitemap. Enter the post IDs in the field and save changes. Under the advanced tab you’ll see options to configure breadcrumbs for your site, your permalinks and any RSS feed related settings. Breadcrumbs help with internal linking and makes it easier to see where a visitor is at on your site as well as provide a clear path back or helps them navigate the site. Breadcrumbs can also appear in search results give your site a bit of advantage. Just enabling the feature and keeping the default settings should be find for most sites, but you can change any settings to suit your site better if you choose. Just be sure to save any changes. 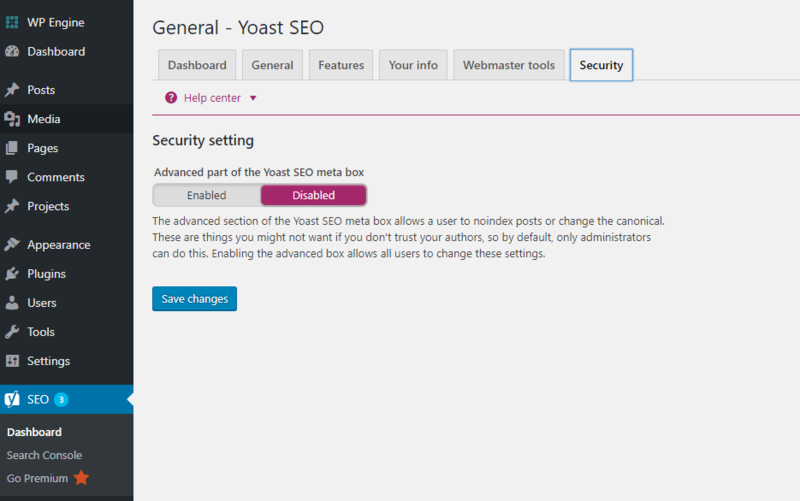 This feature is specific to the Yoast Plugin and not the settings section within your WordPress Site. 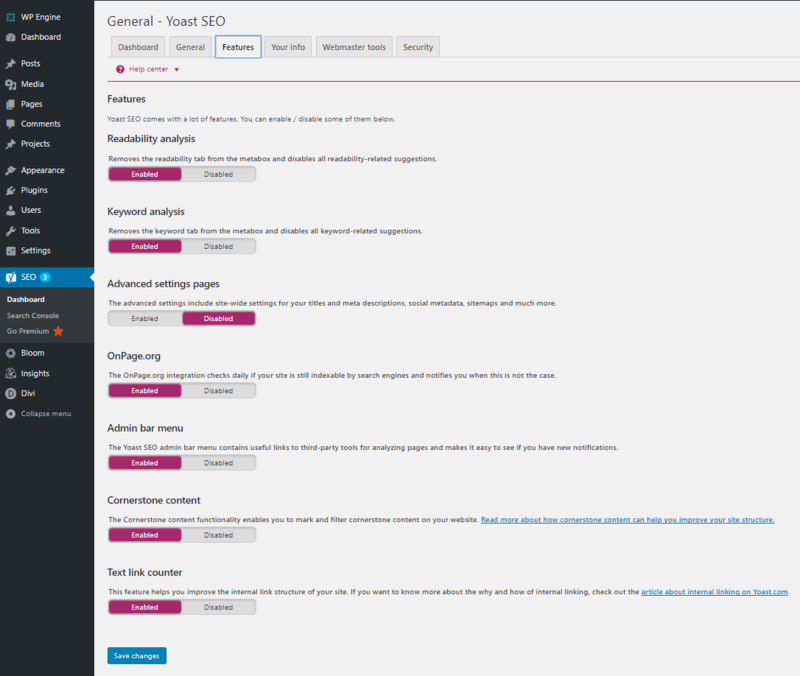 This section assumes that you’ve already set up your Permalink structure in your WordPress settings. When you right a post by default WordPress adds the category name to your URL. This can make for really long, not so friendly URLs. When you choose to remove this feature it will make your URLs more friendly and easier to follow. Be aware though you can run into conflicts if you have a page name with the same url name, if this could be the case it may be better to leave the category feature. Next you can choose to have any attachments redirect to the the parent post. If you upload and add any media like photos or pdfs for downloads to your posts having this feature enabled will redirect anyone that may inadvertently click on a link for a PDF as an example back to the parent page of the file. You can also choose to remove stop words from your permalinks. Stop words are words like to, of, is, and etc. Yoast feels that removing these words from your permalinks will allow you to create cleaner URLS. Personally, I think leaving them in is a good thing and provides a more natural flow to the URL. This is definitely a personal choice. Do what feels right for you. This section gives you options to customize the information that is shared when another site adds your content or shares it on theirs. I have my content shared automatically to a site called Business2Community and this site has a short note the bottom of each post that states that my post was originally posted here on ReneeShupe.com. This helps the search bots know that your site is the place of original content and helping with any issues about duplicate content. For advanced users: How to Add Custom Content and Completely Manipulate your RSS Feeds. 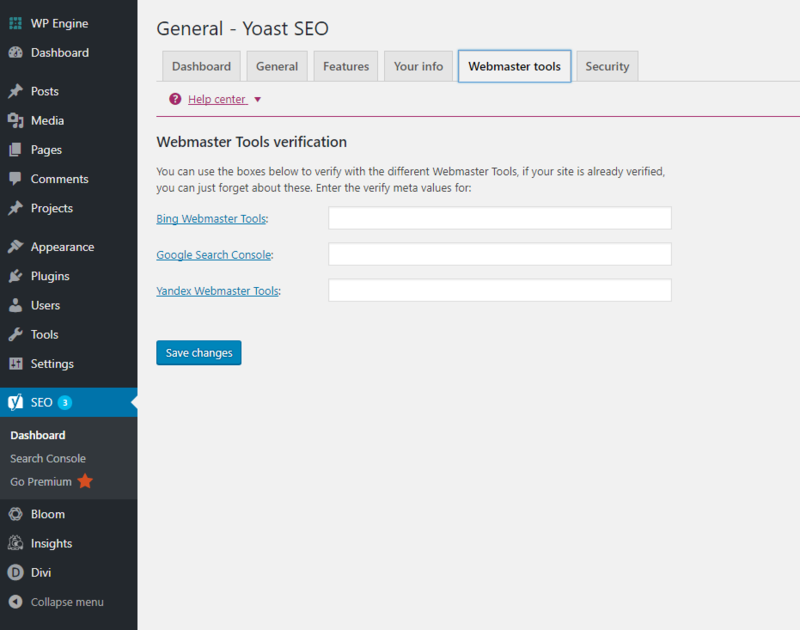 The tool section provides a few tools to help you manage your settings and all your hard work in setting up the Yoast SEO plugin. You have three options. This tool allows you to quickly change important files for your SEO, like your robots.txt and, if you have one, your .htaccess file. Personally, I would recommend for any beginners and even intermediate users only use the Import and Export Feature. You could easily find yourself in a bit of message if you use the other two options and are unsure what you are doing. Click on Google Authorization Code and you will be redirected to Search Console website where you will get a code. Copy this code and enter it in the plugin settings to complete the verification. This is where you can see crawl errors related to your website and mark them as fixed after setting up redirects. If you really want to maximize the use of the plugin then you also need to make sure you are taking time to customize each post using the meta section now available at the bottom of each post. This should simply become part of your process as you’re writing and editing your blog posts. While this could easily do with it’s own post, I’ll cover off some of the basics right now. Click on the Edit Snippet button to get be able to customize this section. This allows you to edit the snippet that will show when it appears in Google search results. It’s a great practice to make sure that you edit this for every blog post. If you leave it, it will pull the first sentence from your blog post and if you have any kind of disclaimer, like an affiliate disclaimer or something similar that is what will appear in your search results. Be sure sure to select a focus keyword, so you can get analysis on how strong your page is for that keyword. Use this analysis as a tool, don’t get so hung up on turning the dot to green. This analysis is meant as a tool and reference point to help you improve your SEO for your site. 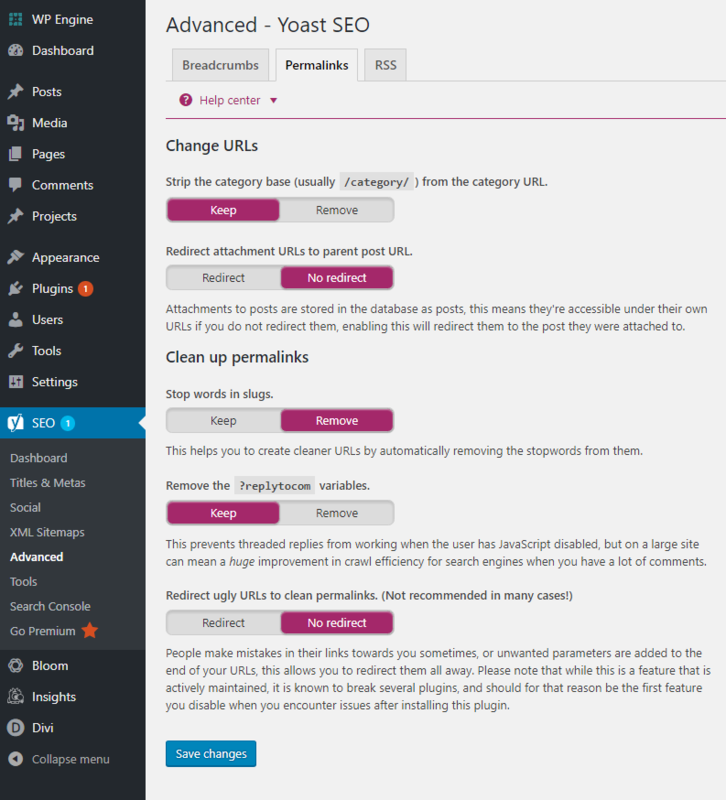 I hope this guide helped you better understand the Yoast SEO plugin as well as provide some clear guidance for installing and setting up the plugin.